Chef Melissa Saunders and I came across the Saint on Saturday night by accident. We had trouble deciding where to go with no reservation. I had almost convinced her and Prince Charming to go to Foxley for dinner, but we passed by and checked out the Saint instead. We were sold by the greeting of a familiar face we had met many times at Buca, a restaurant Melissa and I adore. We enjoyed a cocktail at the bar while we waited for a table. The atmosphere is a sleek and lively tavern. The Saint delivers on the trend of well made cocktails. 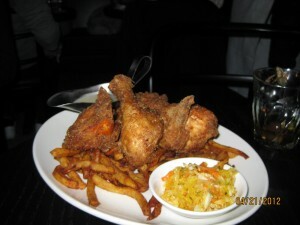 I decided on first glance of the menu that I had to have the fried chicken, a food I love and enjoy a few times a year. Our dinner was pleasant. 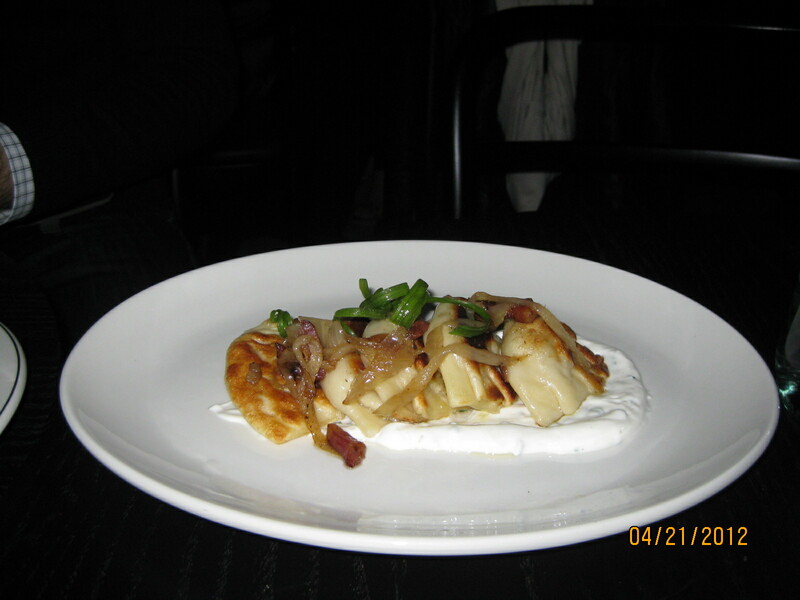 I enjoyed the perogies the most in our group. The menu was not descriptive, but we were told when we came in that everything was made in house. I felt the description of ‘perogies’ was a detriment to the dish, because the perogies had a delicious, tender filling of slow cooked pork. The cod fritters were well done, but perhaps a touch pricey at $18 for 2 large pieces. The fried chicken was half a chicken that was crisp, tender, juicy and well seasoned throughout. The lemon flavoured gravy was not worth the caloric intake in my opinion. My dinner mates quite liked the fries. I didn’t love them. My favourite fries are still Jamie Kennedy’s. Well done veggies was a nice surprise from the Saint kitchen . The cauliflower with bacon was roasted well. The honey roasted fennel with cherry tomato was excellent. Best of all was the coleslaw that came with the fried chicken. Service fell short a bit when we needed to find our server to order a slice of pecan pie and get our bill. The pecan pie was good, but not anything too special. We are not rushing back to the Saint for the food just yet, but it is a welcome addition to Ossington. Another fun spot for a cocktail and snack. The whole strip is great food and drink destination that keeps getting better. Hot water and lemon is a beverage that many natural health practitioners advise people to drink first thing in the morning. Some of the benefits are bringing the body to better balance through improved digestion and liver function. From a practical standpoint, I find hot water and lemon a pleasant way to hydrate after waking up. Adding a spoonful of coconut oil to hot water and lemon is a beverage concoction that I devised recently for the purpose of bringing a client back to better health. We were amazed by the results of having this drink within one week. Her psoriasis improved dramatically and the appearance of her skin in general was much improved as well. The medium chain fatty acids in the coconut oil is quickly taken up by the cells of the body and helps the cells absorb nutrients. It is great to see this improved nutrition physically in skin, as the skin is the largest organ of the body. I tried the beverage myself and found an improvement in my skin and hair in addition to some fat loss. The flaky skin that I ordinarily experienced from sun exposure was markedly improved after a few days of drinking this beverage. I lost some body fat in the past month or so from a combination of having this beverage, going to an outstanding yoga retreat in Jamaica with Alyssa Cohen, and keeping up my exercise program. This beverage is a health booster! -Squeeze the juice of 1/4 or 1/2 an organic lemon into a mug. -Stir and fill the mug with room temperature water. Please share with us what you notice in yourself after taking this beverage. Eating foods rich in antioxidants can help prevent illness and slow the aging process. The question what is oxidation, is one I am asked frequently. An easy visual example is imagine cutting an apple in half. What happens in half an hour? The apple starts to turn brown and maybe dry up a bit. This is due to exposure to oxygen and the chemical reaction that occurs in the presence of oxygen (the chemical reaction is oxidation). We need to eat foods with antioxidants to counteract the environmental stressors our bodies are exposed to such as, alcohol, sun, smoke, pollution, and various other forms stress we experience. 1. Oats-are a source of selenium, vitamin E and soluble fibre, which also helps lower blood cholesterol. 2. Berries-blueberries, blackberries, raspberries, strawberries are rich sources of vitamin C and many other beneficial phytochemicals. They are a fruit that is lower in sugar and easy to eat. 3. Broccoli-is rich in vitamin C and indole-3-carbinol, a cancer fighting phytochemical. Try pre-cut broccoli slaw mixed in with your regular salad. If you will not eat broccoli, try other dark leafy greens such as kale, collard greens, watercress, bok choy. 4. Carrots-are a food that most people like to eat raw, so enjoy regularly for its betacarotene, precursor to vitamin A content. If you do not like carrots, try fresh carrot apple juice. 5. Dark chocolate-(try one with a lower sugar content, less than 5 grams of sugar per serving) is fun to eat and contains vitamin C and is a great source of flavinoids, another type antioxidant compound. 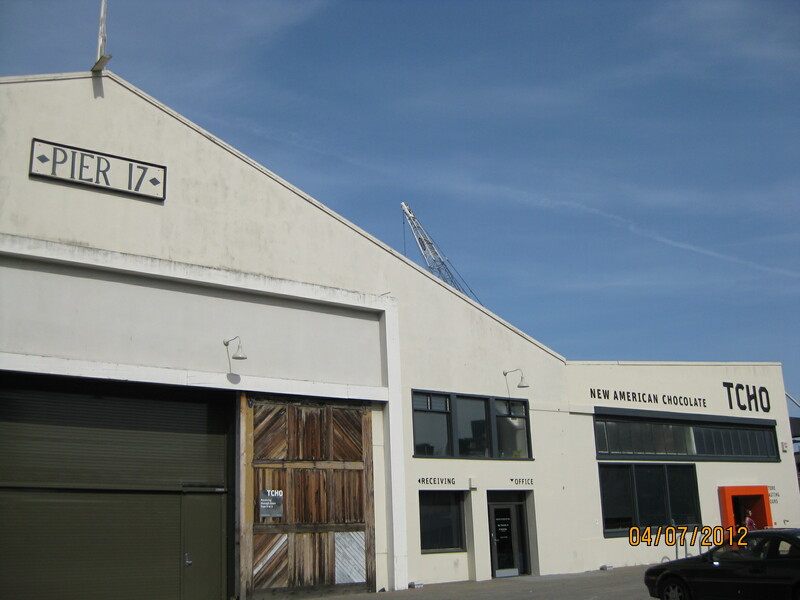 Having recovered from two consecutive late nights, I went for a most enjoyable workout along the San Francisco waterfront this afternoon. Many different spots along the way needed a short slowdown due to fellow pedestrian traffic or just scenery to take in. The run was more of an interval walk/run workout, but still strenuous enough to break a sweat. 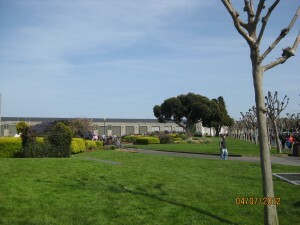 I would recommend running to Pier 39 (the green space around it is pictured below), as past that point is Fisherman’s Wharf, a serious tourist trap with massive crowds that are tough to navigate even walking. I ran most of the way back and had to stop for a little chocolate sample at TCHO. How could I resist a sign with an arrow that says chocolate? 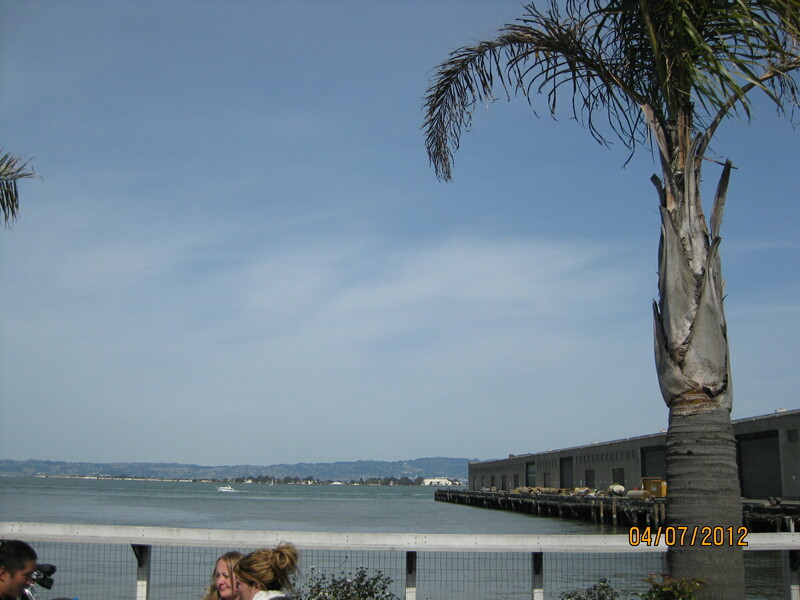 Then, it was time for a stretch on Pier 7 while taking in the view of the Oakland Bridge. 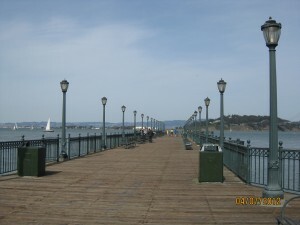 -Plan to briskly walk or run from the Ferry Building to Pier 39. -Take in and enjoy the scenery as it inspires you. 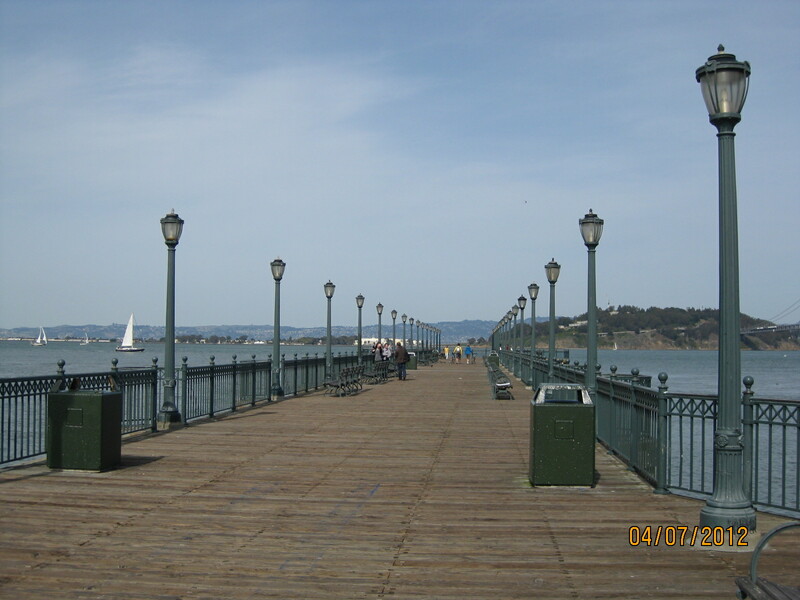 -Brisk walk or run back the entire way from Pier 39 to Pier 7, stretch and cool down on the long wood pier. -Enjoy some great food by the Ferry Building or anywhere else that catches your fancy. 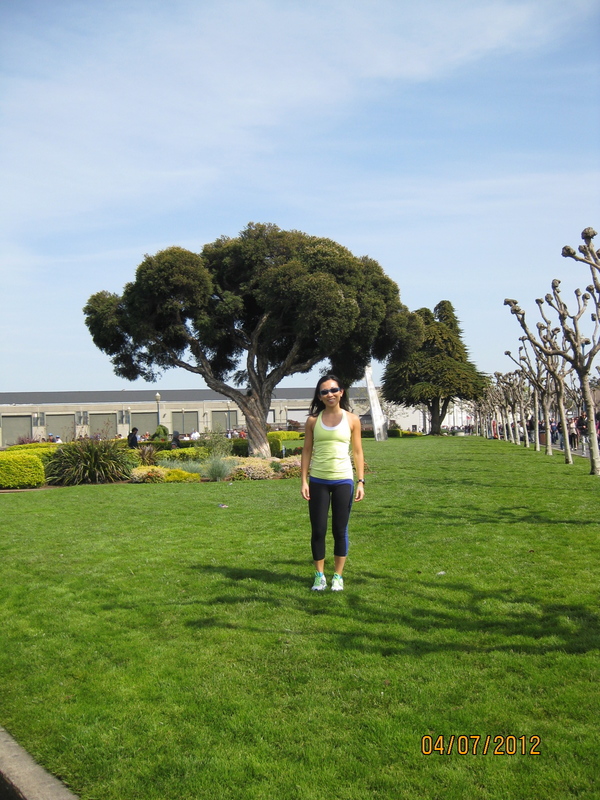 San Francisco is inspiring, but a similar workout to this one can be done in any town with a waterfront for scenery. I walked by Yogorino’s during my last trip to San Francisco. I had eaten plenty already, but their tagline was ‘the best tasting yogurt in the world’ caught my attention. And there was something about the shop that seemed a little different than the choose your own topping frozen yogurt places that are proliferating everywhere. I went in and inquired about the claim and the helpful young lady there, Aljarice was happy to give me a sample. The frozen yogurt, which I tasted with no toppings was delicious, with a creamy texture like soft serve icecream. This frozen yogurt was the best I have tasted from a frozen yogurt shop. She told me the difference was 2% organic yogurt and natural sweeteners. I had a mini sample with a little bit of topping for fun, very tasty and satisfying because of the creaminess of the yogurt. I was told that the small portion of the frozen yogurt before toppings is 80 calories and a similar amount of sugar to regular sweetened yogurt, but so much more fun to eat! This was such a tasty treat, that I almost forgot that it qualifies as a healthier type of treat. It was like having an icecream with probiotics, lower fat and real fruit toppings. Yogorino’s is in San Fran and Philadelphia so far in North America, but is fast growing in Italy where it originates and is branching out through Europe, Asia and other parts of the world. This was the Allweather Landscape garden at Canada Blooms. I loved the way the trees were proportioned to the flower beds. Here is Dr Landscape himself Tony Lombardi in his award winning garden Ethnography at Canada Blooms . Tony is a real talent in creating urban green space. Enjoy his work outside of the Summerhill liquor store. I have enjoyed a danish or macaron from Petite Thuet on many sunny days there. Golden Gate Park is at least a full day of zen green moments, including the Japanese tea garden. Enjoyed these plants on my way out of Golden Gate Park. 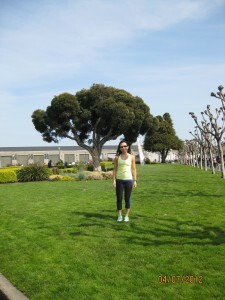 A great green spot for a zen moment can be found almost anywhere. It’s a matter of taking a moment to take it all in and appreciate being there. Try taking in the beauty of a green setting by stopping and taking ten deep breaths the next time you pass by a spot that you like, you will feel good! Blend acai puree and milk in blender until thick and pour or scoop into a bowl. Drizzle with honey. Top with granola, sliced banana and berries-enjoy! Enjoy as a light breakfast, healthy snack or dessert. The jicama salad at Mijita in the Ferry Building of San Francisco is an all time favourite salad of mine. Mijita is a casual taqueria opened by chef Tracy Des Jardins. This salad has the perfect blend of flavour, texture and nutrition. 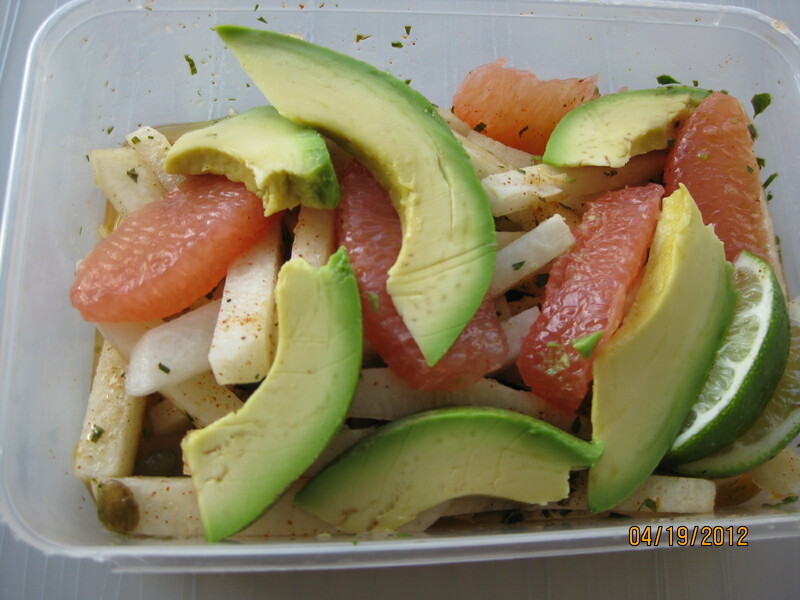 There is vitamin C and other phytochemicals in both the jicama and grapefruit. Healthy fats are found in the avocado and toasted pumpkin seeds. The taste and texture of it all is outstanding! I have written in to Bon Appetit RSVP to try and get the recipe. I saw a few spots on Oahu, Hawaii last year that served ‘bowls’ of fruit, non dairy milk and granola that looked interesting, but I did not get around to trying out. I finally tried an acai bowl yesterday at Blue Hawaii in San Francisco. What I ordered was called the Blue Hawaii and it consists of frozen acai pulp blended with organic soy milk, topped with organic granola, sliced banana, strawberries, blueberries and honey. It was a delicious refreshing treat that was satisfying and great to have for some energy just before a run. I imagine it would be good to have after a workout as well. My Blue Hawaii acai bowl was so delicious that it qualifies as a healthy dessert, breakfast or snack in general. The antioxidant boost that the acai and berries provide is a great bonus! Blue Hawaii Acai Cafe is in Honolulu, San Francisco and Shanghai so far. Look for an acai bowl at a juice bar near you. Otherwise, I will have to try and replicate the recipe myself and post it here. I do not watch much television. This piece on 60 minutes was mentioned to me by many people in the past few days, because it scared them, so I made an effort to watch it. I found the piece interesting and it provided some good information to the public. Essentially, eating a diet that is high in sugar and/or refined carbohydrates contributes to chronic disease such as obesity, diabetes, heart disease. I disagree that sugar and high fructose corn syrup are equally bad. Sugar consumption has gone down by 40% and has been replaced with an equal or greater volume of high fructose corn syrup. However, Americans are heavier than ever before. High fructose corn syrup is a highly processed food product, much more so than organic sugar, which is from crystallized cane syrup. Dr Stanhope’s study where people were given 25% of their caloric intake from a high fructose corn syrup sweetened beverages just proves the point that it is not a good idea to drink those beverages. 25% of a 2000 calorie diet would be 500 calories and that is the rough equivalent of 3.5 cans of pop. When Dr Gupta goes in for his MRI with a sip of soda and has his brain reward centres light up, that is understandable since the start of the piece lets you know that we are wired to like sweet tastes. It is linked to survival. Eating calories, keeps you alive and well. Jim Simon from the sugar industry didn’t have a chance against the doctors (he was set up), because he had no ‘science’ to back him up. He did have a good point that we should try to have a balanced diet and exercise. He is the only person in the piece that mentions exercise! Exercise is a part that is missing in many dietary debates and we know that is something that is missing in the North American lifestyle in general. The recommendation in the end is to limit your added sugar intake to 150 calories for men and 100 calories per day for women. That is the equivalent of 37.5 grams and 25 grams of sugar per day for men and women respectively. This a reasonable limit to aim for. It is actually the equivalent of the majority of a 100g dark chocolate bar. My advice: Be active, exercise regularly, eat lots of veggies/fruit, eat real food and truly enjoy the moderate amounts of sugar you consume. No pop-regular or diet!